Psychologist C.K. Jung said, “A man is not a thing, but a drama.” Well, a rock is not a thing, but a drama – only existing on the vast scale of geological time. Pick one up sometime, any rock, and you’ll be holding something that contains the entire periodic table, every known element in the universe. Is it a metamorphic or sedimentary rock in an igneous environment? How did it get there? What’s its story? They all have a story, the rocks under our feet and all around us, made up of the 5,000 or so substances of the mineral world that make up 90% of the mass and volume of the Earth. Geology, simplified, is the study of the Earth’s inorganic substances, its processes and the planet’s history. But that definition does no justice to this elegant, almost metaphysical science. Geology reflects the universal axiom of Hermetic philosophy: As above, so below, as displayed by the fact that the mineral substances in the planets and stars above are exactly the same ones inside our bodies and in the ground beneath us (and they are formed in exactly the same way). One of geology’s major concepts, fromulated by James Hutton in the 18th Century, is called Uniformitarianism, the stipulation that all the laws of the universe have been the same since the beginning of the universe. To put it spiritually and more poetically, “There is nothing new under the Sun.” This idea begat today’s science, influencing everything from Darwin’s thinking to modern physics, prodding the concept of the universe as a “closed” system – all the matter and energy in the universe has existed since the beginning of the universe, and there is only a transfer from one state to another. In other words, matter cannot be created or destroyed, only transformed. Geology is the great unifying science of the world, the eye of the needle all other sciences do, at some point and in some way, pass thru – astronomy, art, linguistics, paleontology, physics, biology, philosophy, medicine, chemistry, religion, agriculture, anthropology, sociology, meterology, geography, mathematics, climatology, economics … on and on goes the list. 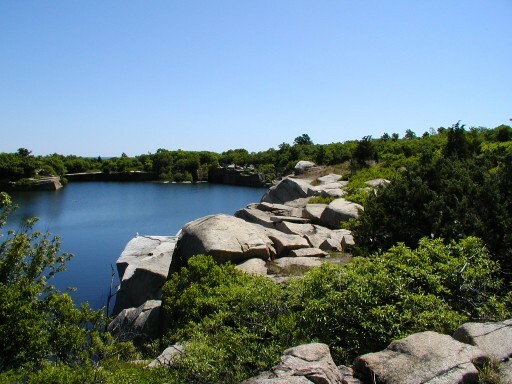 Cape Ann is an extraordinary geological area and Halibut Point State Park is a great place to see that for yourself. Here are some surprising facts about the geology of Cape Ann: Of the 5000 or so mineral substances that make up the vast majority of the mass and volume of the Earth, two, Annite and Danalite, were discovered on and primarily exist around Cape Ann. Annite, named after Cape Ann, was first identified in Rockport. You can learn more about Annite here. Danalite, named after geology professor J.D. 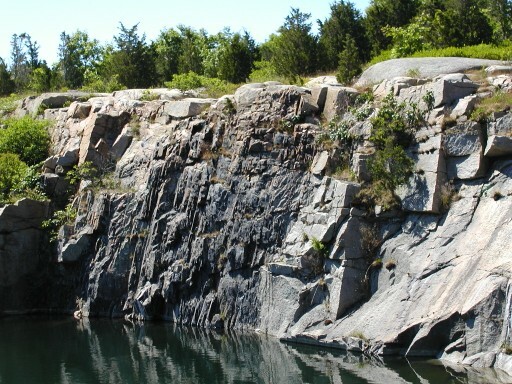 Dana, was initially identified at a Rockport Granite Company quarry in the 19th century. This link gives you more information about Danalite and this Wikipedia excerpt will tell you more about Professor Dana, one of the foremost figures in the history of geology. If you’d like even more evidence of how geologically active Cape Ann is, check out this story from USA Weekend magazine, or this one from the Boston Globe, or have a look at this article in American Heritage. If you want to see a charting of some of the long list of earthquakes that have happened on and around Cape Ann, just go here. 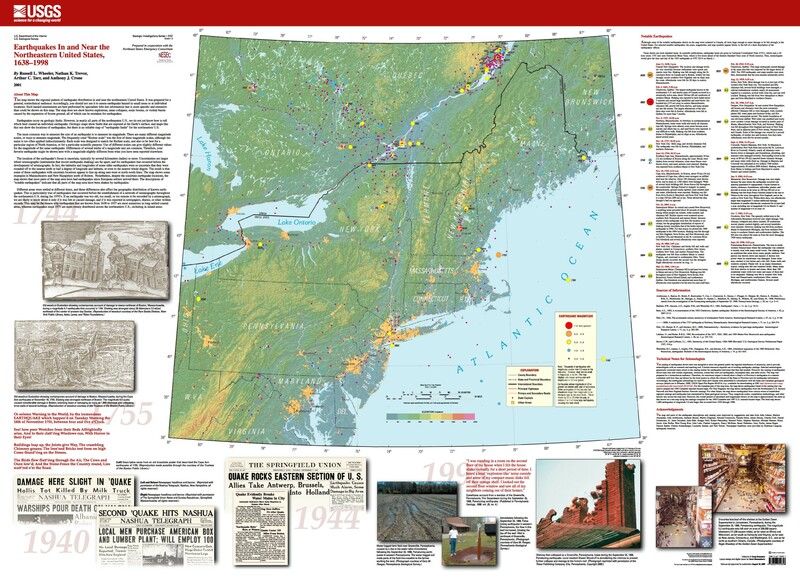 Better yet, click on this extraordinary map, “Earthquakes In and Near the Northeastern United States, 1638-1998” from the US Geological Survey. If you go to websites such as Microsoft TerraServer or Google Earth you can see some of the unique features of Cape Ann’s geology. One of them you’ll notice is that the land beneath the region’s feet is so riddled with faults that it looks like a cracked windshield! Just what exactly makes Cape Ann’s geology so active and so noteworthy? That’s a longer story than a version of Notes should detail, but some clues are contained in the photographs published below this posting’s heading. Geology is a science best savored in the field, away from the classroom and all that Godwana-Laurentia-Pangaea/continental rifting/plate tectonics talk we initially experience in school when exposed to the subject. Yes, there’s a place for all that, but there’s so much to see around us to spur curiosity in this profound, graceful science and Halibut Point is a spectacular place to experience it. The last version of Interpreter’s Notes promised an explanation of how Cape Ann granite achieved its unique 160lbs. per cubic foot density. Briefly – at the end of the last great Ice Age, about 15,000 years ago, retreating glacier scraped many millions of years of sedimentary rock off the massive bedrock of granite that today makes up most of Cape Ann. 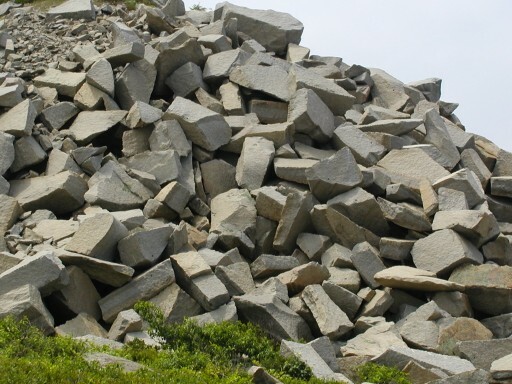 The bedrock granite, under the pressure of sedimentary rock for so long, became evern more compressed than it was, and once the glacier scraped the surface sedimentary rock away, it left the granite close to the surface. There may be granite of similar of greater density elsewhere, but most of it, never having had the benefit of such a staggering force of as a mile high mountain of ice to bring it near the surface, remains far under the ground where it cannot be mined. If you look above at the center photograph under this posting’s heading you can clearly see the striations on the smoothed boulder, tracking north/northwest to south/southwest that was made by the retreating glacier. Such evident examples of the last Ice Age exist all over Halibut Point, especially in the park’s “scablands” – the still existing grassy balds not far from the Babson Farm Quarry. How wonderfully they state it! The War of 1812 is one of America’s least understood military conflicts. Though it was ignited by a number of ostensible causes, at its core that war was about eradicating British influence in North America. For decades after the American revolution Canada remained a British colony, allowing England to contend for settlement of the upper-Midwest of America. By the early 19th Century Britain still remained the world’s greatest colonial power, but its military might was being stretched thin. 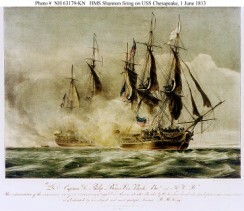 The war started over the issue of the British Navy’s “impressment” of personnel on American merchant vessels. On the high seas, Britain would not hesitate to stop and search American ships in hopes of recovering sailors they viewed as deserters, which included many naturalized American citizens. Britain, long at war with Napoleon’s France, was in desperate need of sailors for their fleet to the degree of even “press-ganging” native-born Americans. Due to the conflict in Europe, the United States Congress cut-off all trade with European nations, a move very unpopular in New England. In an attempt to further foment dissention, the British Navy didn’t interfere with New England merchant vessels violating the trade ban, a policy that lasted until New England trade was seen as benefiting France as much as or even more than Britain. By 1813, frigates of the British Navy were patrolling outside harbors along Massachusetts Bay. Henry Edward Napier, a lieutenant on the H.M.S. Nymphe, wrote in his diary segment called Prizes at Halibut Point of “laying in wait, like a spider for flies, for coasters from northward and southward.” The citizens of Sandy Bay (now Rockport) finally extracted a measure of revenge on the Nymphe in the battle of “Sea Fencibles,” leading to an eventual negotiated stand-off where the captain of the Nymphe agreed to vacate the waters off Cape Ann. 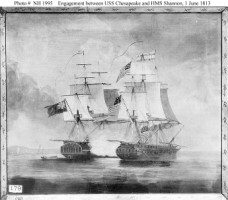 The battle between the Chesapeake and the Shannon, lasting about fifteen minutes, had total casualties of nearly one hundred dead and one hundred and fifty wounded. Details of this incredibly dramatic encounter and the events leading up to it are best detailed in Kenneth Poolman’s book, Guns off Cape Ann. The other significant source material for information about the events off Cape Ann and Halibut Point in the War of 1812 is The Journal of Henry Edward Napier, Lieutenant in the H.M.S. Nymphe, published by the Peabody Essex Museum of Salem, MA in 1939. Some great resources for information about the War of 1812 are this Wikipedia article, the US Naval Historical Center site and Benson J. Lossing’s 1869’s Book of the War of 1812, which you can view here. This is but the latest information we at Halibut Point have gathered in research of our site’s military history. You will be able to learn much more in the new exhibit debuting inside our Visitors Center on Saturday, September 29, 2007. 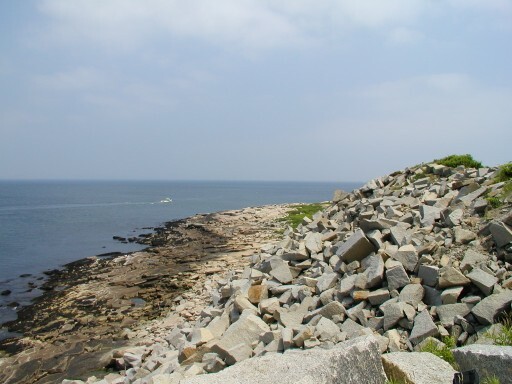 This permanent installation, titled, The Military History of Halibut Point, is the result of efforts by the Massachusetts Department of Conservation and Recreation, its Bureau of Ranger Services Park Interpretation and Environmental Education Program and the Friends of Halibut Point State Park. The Military History of Halibut Point, with information and artifacts ranging from the War of 1812 through the early 1960’s, is dedicated to all the men and women who have served in the United States armed forces. Everyone is invited to this unveiling. More details will be posted in August. We hope you all will consider attending. Perhaps the most popular visual feature of Halibut Point State Park is the Overlook in its northeastern corner. Standing above a 50′+ granite grout pile over the rocky shore, the Overlook is the site of several weddings a year and even more marriage proposals. Perhaps that’s why Outdoor Recreation has named Halibut Point one of the top ten romantic spots in America. From the Overlook, one can see Ipswich Bay, the mouth of the Merrimac River, the miles of sandy shore at Salisbury Beach Reservation, the Isle of Shoals in New Hampshire, Mt. Agamenticus and Boon Island in Maine, and even more on the right day. 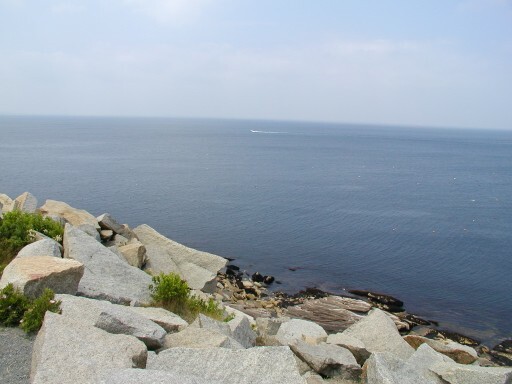 When you stand at the tip of the Overlook at Halibut Point, you are on the closest spot in the continental United States to the continent of Europe – (that’s continent-to-continent) – the next stop is Cape Finisterre, Spain. Staring down from the Overlook, the significant mountain of granite beneath you (known in quarry slang as a “grout pile”) represents the unused remants of the long abandoned Sandy Bay Breakwater project. As far back as 1830 there was advocacy to make Rockport a national harbor of refuge, one reason being the lack of a large harbor between Portland and Boston. It was over fifty years later before the idea took steps toward rock-solid reality, finally commencing in 1885. Yet by thirty years later and after nearly two million tons of cut stone, from Babson Farm Quarry and other Rockport quarries, was placed onto sloops and scows and set beneath almost a thousand acres of sea bottom, the project remained barely one-quarter complete. Perpetually behind schedule and over budget, the federal government declined to continue financing the project, leaving what was intended as a refuge of safety to become the manmade hazard many see it as even today. From the top of the Overlook you can see the unfinished breakwater as the long line of stone offshore to the far right. You can find a detailed story about the early history of the Sandy Bay Breakwater in this 19th Century archival issue of Harper’s Bazaar. After gazing to the far right at the Sandy Bay Breakwater, gently swing your eyes slightly left at the gull-bleached mound warting up from the sea: It’s the Dry Salvages – a bare knuckle of granite with a name controversy too convoluted to detail in a few words, this slab above the spit is best known as the title of the third segment of T.S. Eliot’s Four Quartets. Eliot, born in Missouri, spent many summers of his youth on Cape Ann and The Dry Salvages is the only one of Eliot’s Four Quartets with an American setting. That’s how Eliot described them in this work. Four Quartets, each one written between a span of years, was published in 1943 and many view it as Eliot’s masterpiece, even going so far as to say it’s the work most responsible for his 1948 Nobel Prize award. The work draws upon Eliot’s lifelong reflections upon symbolism, philosophy, mysticism and Christianity. It’s quite an experience, bringing a copy of the text out to the Overlook and reading it while pondering the Salvages and the stoney shore below. Eliot, some say, is “out of favor” today, but that’s hard to truly believe – type in T.S. Eliot on Google and you’ll come up with nearly two million hits! Granted, Eliot as a writer does make you “do your homework,” but he’s well worth it. For more about T.S. Eliot, Wikipedia’s article about him is a good information source, as is this one about Four Quartets. For the entire text of The Dry Salvages, go here. If you’d like even more evidence of how geologically active Cape Ann is, check out this story from USA Weekend magazine, or this one from the Boston Globe, or have a look at this article in American Heritage. If you want to see a charting of some of the long list of earthquakes that have happened on and around Cape Ann, just go here. Better yet, click on this extraordinary map, “Earthquakes In and Near the Northeastern United States, 1638-1998″ from the US Geological Survey. If you go to websites such as Microsoft TerraServer or Google Earth you can see some of the unique features of Cape Ann’s geology. One of them you’ll notice is that the land beneath the region’s feet is so riddled with faults that it looks like a cracked windshield! Just what exactly makes Cape Ann’s geology so active and so noteworthy? That’s a longer story than a version of Notes should detail, but some clues are contained in the photographs published below this posting’s heading. Geology is a science best savored in the field, away from the classroom and all that Godwana-Laurentia-Pangaea/continental rifting/plate tectonics talk we initially experience in school when exposed to the subject. Yes, there’s a place for all that, but there’s so much to see around us to spur curiosity in this profound, graceful science and Halibut Point is a spectacular place to experience it. 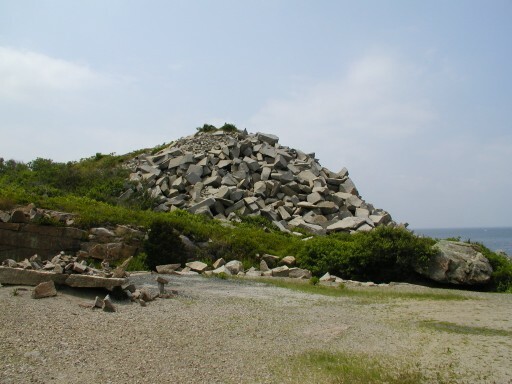 An earlier version of Interpreter’s Notes promised an explanation of how Cape Ann granite achieved its unique 160lbs. per cubic foot density. Briefly – at the end of the last great Ice Age, about 15,000 years ago, retreating glacier scraped many millions of years of sedimentary rock off the massive bedrock of granite that today makes up most of Cape Ann. 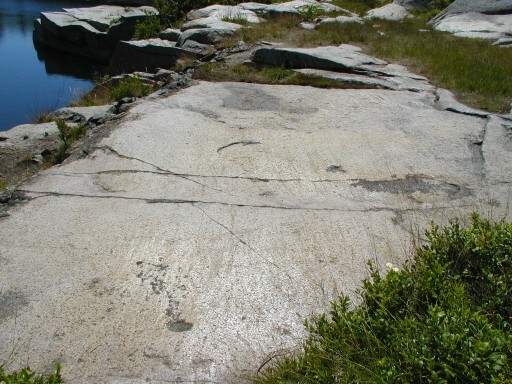 The bedrock granite, under the pressure of sedimentary rock for so long, became even more compressed than it was, and once the glacier scraped the surface sedimentary rock away, it left the granite close to the surface. There may be granite of similar of greater density elsewhere, but most of it, never having had the benefit of such a staggering force of as a mile high mountain of ice to bring it near the surface, remains far under the ground where it cannot be mined. If you look above at the center photograph under this posting’s heading you can clearly see the striations on the smoothed boulder, tracking north/northwest to south/southwest that was made by the retreating glacier. Such evident examples of the last Ice Age exist all over Halibut Point, especially in the park’s “scablands” – the still existing grassy balds not far from the Babson Farm Quarry. The most popular visual feature of Halibut Point State Park is the Overlook in its northeastern corner. Standing above a 50’+ granite grout pile over the rocky shore, the Overlook is the site of several weddings a year and even more marriage proposals. Perhaps that’s why Outdoor Recreation has named Halibut Point one of the top ten romantic spots in America. From the Overlook, one can see Ipswich Bay, the mouth of the Merrimac River, the miles of sandy shore at Salisbury Beach Reservation, the Isle of Shoals in New Hampshire, Mt. Agamenticus and Boon Island in Maine, and even more on the right day. Decked out in t-shirts as blue as the Maine sky over Chase’s Pond that afternoon, staff and volunteers bustled around us and up ahead as we made our way from the street onto the grounds. All the excitement was over the 2009 “Wild About Our Community” event at the Center for Wildlife, Cape Neddick, Maine. The CFW, one of the largest animal rehabilitation facilities in New England, is becoming an increasingly significant education partner with the Massachusetts Department of Conservation and Recreation due to the extraordinary and varied off-site wildlife learning opportunities they bring to the region. Their invitation to attend on this day was my first visit to their location. I had the pleasure of encountering my first representative from the Center’s considerable number of sponsors and partners when I met Dan Gardoqui, Founder & Director of White Pine Programs (www.whitepineprograms.org), a nonprofit educational organization providing nature based programs for all ages. “The area around the home that kids are allowed to wander has shrunk to less than 10% of what it was in 1970,” Dan informed me. “As a result, lots of children today can’t identify an oak tree or a grasshopper,” he continued. While I listened, there was the same quiet passion in his tone and directness in his gaze that I witnessed in Richard Louv when he spoke about his book, Last Child in the Woods. After looking over White Pine’s brochure detailing their core programs I had a closer look around me and came away with an inkling that the Center for Wildlife, its partners and sponsors all had something special in common and I set out to learn more what that was. “Have you been to Mt. Agamenticus lately?” Robin Kerr inquired. I had to admit it was a long time since I had, though it is nearly always visible from the Overlook at Halibut Point, looming over the shore as one of the highest elevations along the East Coast so near the sea. “We can usually always see it from the park. On the right winter’s day we can even make out the tower,” was the best I could come up with for a recent experience with the Big A. Robin, the Conservation Coordinator for the Mt. Agamenticus Conservation Region (www.agamenticus.org) for the past six years stood by her organization’s display and removed her sunglasses to connect with me eye-to-eye: “ Things have changed since back then” she said, able to name eight current conservation partners. She explained the work and stewardship challenges of maintaining the acres for watershed, flora and fauna conservation as well as for recreation purposes, each one alone a daunting challenge for any conservator. More importantly, as she let me know about MACR’s successes and going-forward plans I felt a charge in her voice as strong as a pelting northeast rain powerful enough to turn the mountain’s granite to granola. “This mountain rules!” the group’s trail guide says. And there on Mountain Road in the shadow of Agamenticus I met an advocate who did the same. Adjacent to the presentation stood the Center for Wildlife’s office. I paused in front of the modest sculpted pond prefacing the entrance, squinting ahead at the sign to the side of the door. “Animal Intake” were the important words. Even amidst the hubbub of the day I felt a zone of serenity, the recuperative hush experienced before approaching an important medical unit. Rescue … Rehabilitate … Release. Stand here at you’ll know down to your core what the Center for Wildlife is all about. A few feet away I met Josh Baston of ReVision Energy (www.revisionenergy.com). I mentioned that at Halibut Point we’ve been using solar, photovoltaic and geothermal renewable energy resources since the mid 1990’s and Josh, sans any further information, was able to correctly detail the features of our older technology. He pointed at a solar panel ahead of us on the roof of the CFW office and outlined the difference between that installation and the one we had at our site. “ReVision Energy has installed more than half of all solar energy systems in Maine over the past few years,” he told me. I wasn’t surprised. The Seacoast Science Center (www.seacoastsciencecenter.org) Great Works Regional Land Trust (www.gwrlt.org) BioDiversity Research Institute (www.briloon.org) York County Audubon Society(www.yorkcountyaudubon.org) – I met representatives from them all and even more organizations, leaving me to stop at the end of presentation row, have a look back and take stock at what I was witnessing. I could hear storyteller Shawn Middleton, see Ed & Ken so genially scooping ice cream and families grabbing some pizza. Scanning the day’s program, a quick count listed nearly fifty partners, sponsors and donors participating in this event. “Building a sustainable future for wildlife” – those are words I’ve seen CFW use more than once. And that’s when I realized what everyone at “Wild About Our Community” had in common – they were pioneers of a notion that there are better ways to live. And for at least one day nobody had to make much effort to find them. Hawks, falcons, owls, porcupines, opossums, bats, squirrels, woodchucks, muskrats, songbirds, ducks, geese, swans and more -up to 150 different species – I discovered the Center for Wildlife rehabilitates and sometimes permanently cares for as I visited their natural history area. Among the series of spaced enclosures for the animals I met CFW Board member Dawn Dickinson while reading interpretive signage by the opossum’s residence. “They did a great job, didn’t they?” Dawn smiled, explaining the materials, laminate and font on the paneling. I smiled back; as an employee of the DCR Bureau of Interpretive Services I knew the level of passion necessary to embrace and be excited about the intricacies and subtleties of a public information display. I spent the rest of my visit to the Center for Wildlife in the natural history area watching a number of live-animal presentations by staff and volunteers spaced between a number of wild bird releases that children in the audience were invited to participate in. Kristen Lamb, CFW Education and Outreach Director, took some time from a very busy day to stand beside me for a chat. “What’s the most fulfilling part of what you do?” I asked her. “Countering human impact on animals,” Kristen told me. “Humans sometimes injure them … we care for them.” I thought about what Kristen said as I took a look around me. How many times had I seen an animal by the side of the road, bedraggled and hurt? Or heard its cries in some nearby woods and thought it was some poor creature that hasn’t got a prayer? Well, many of these animals do have a prayer in Cape Neddick, one the Center for Wildlife answers some 1600 times a year. You can discover more about the Center for Wildlife here. Martin Buber said, “An animal’s eyes have the power to speak a great language.” That day at the Center for Wildlife, Cape Neddick, Maine, I met a community of incredibly caring people and felt the power of a great language spoken from the hearts of some fellow human beings. The Center for Wildlife, Cape Neddick, Maine will be back at Halibut Point State Park with more of their wildlife ambassadors for a Birds of Prey program on Saturday, September 26th at 1:00pm. This FREE event is sponsored by the Massachusetts Department of Conservation and Recreation and the Friends of Halibut Point State Park. You’re all invited to come and learn more about this wonderful organization.